Dream Life is the first full length album with Michael as the primary song writer. The mystery is that Michael is not listed as part of the band. Some sources quote Knott as saying that he had a nice gig with the Lifesavors at this point because he was writing the songs but not part of the band. 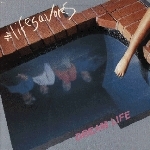 The Lifesavors are still doing a surf/new wave punkish sound at this point. I have this on LP and would love to get a clean digital copy on cd or mp3. Any chance of a release? The cassette didn’t hold up so well… It worbles a lot… Great album, guess I wore it out all those years ago. Yes, Mike Knott did record the original vocal tracks, after Mike left the band, Brian Goins joined the group and then me. I recorded 6 of the songs and Brian sang 5 of them. We then went on tour but Brian couldn’t go, so Mark Krischak the original founder of the Lifesavors joined us for the tour. One of my favorite albums. I think I might dig it out so I can listen to Walk Nowhere one more time. Kirk, did you not record a single after Dream Life? I could be wrong. I loved this Tape lol one of my faves… Okay you think that you’re a Christian run around drunk on scotch and martinis and the shattering glass entering your hands I see ….you try to come over my eyes…. loooooove it.